VALENTINO is a fancy and modern 4 Seater Outdoor Lounge Set designed to bring a breath of fresh air with its relatively compact areas such as patio or veranda while also adding style and class to your outdoor or indoor space with its wicker trendy touch. The Valentino, made from Wicker, a stylish material that resembles natural rattan. It looks chic and classy and its compact, a perfect combination for the smaller areas. 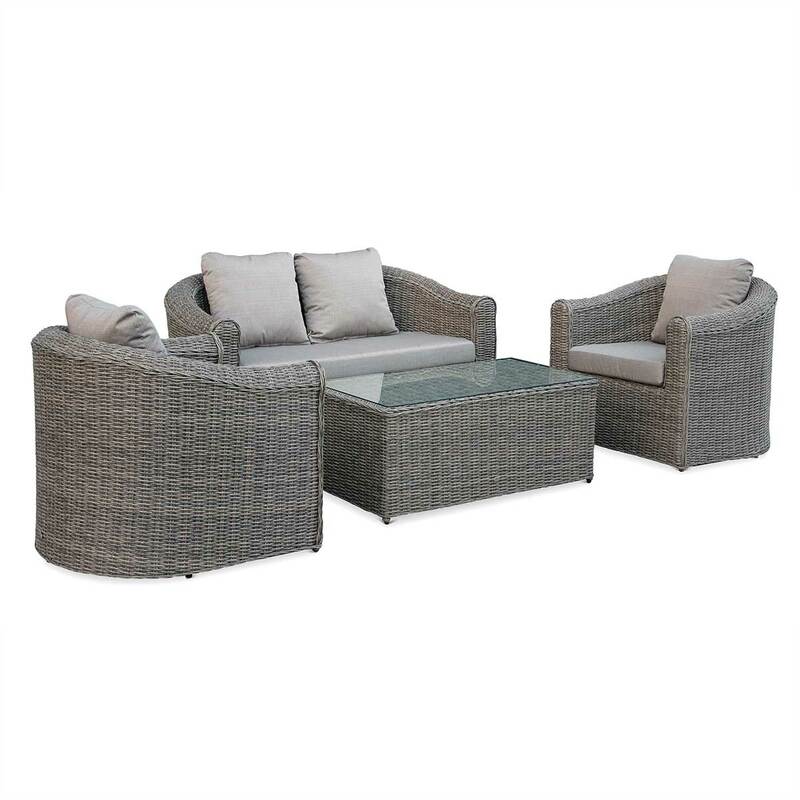 With its 9cm thick cushions and its wide armrests it can guarantee the ultimate level of comfort and this beautiful on-trend Outdoor Lounge set easily accommodates 4 people. With its fancy and romantic look, the Valentino fits easily both inside or outside. Alice’s Garden ensures the longevity of the Valentino by carefully selecting the best-quality materials to weave its furniture. Wicker is a synthetic material that is ideal for outdoor use. It is resistant to the sun’s rays and to poor weather (snow, rain, salt water). The cushions are water resistant and have removable covers which can be cold washed. The galvanised steel frame of this product is powder coated. This treatment offers greater protection against rust. The top of the coffee table is made from 5mm-thick toughened glass. This is 5 times stronger than traditional glass! 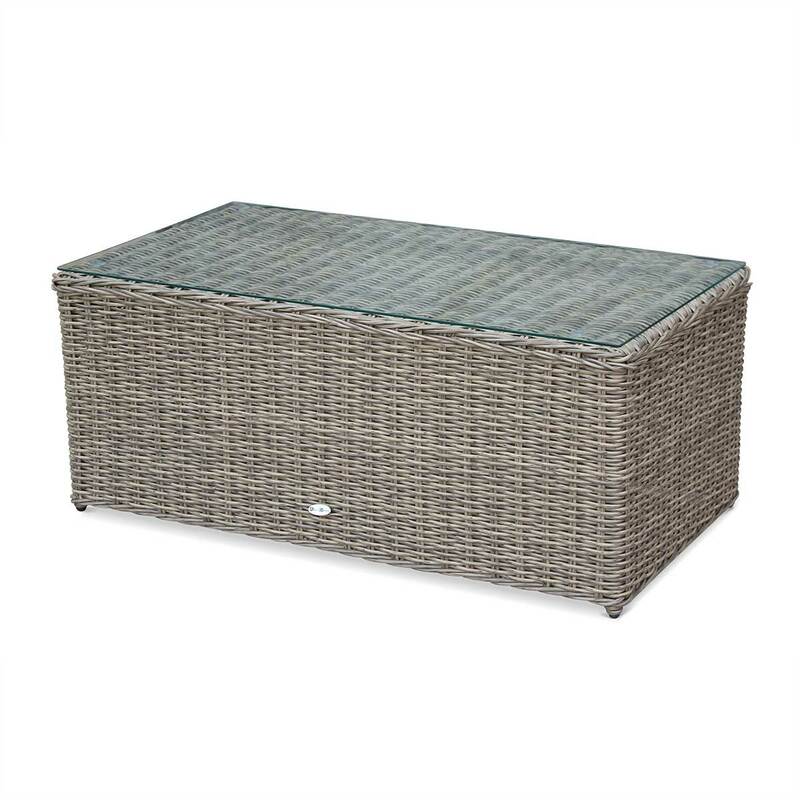 Please note: Product is handmade from Wicker, not from rattan-look plastic sheeting, resulting in a genuine superior comfort and quality. The colour in the photo may vary depending on your screen’s settings.